Coffeeshop Feels Good is located on Oudezijds Voorburgwal right in the heart of the Red Light District in the centre of Amsterdam. This area is very populated and as such this place can get busy at any time of the day. As you enter you will see the counter in front where you can make your purchase. 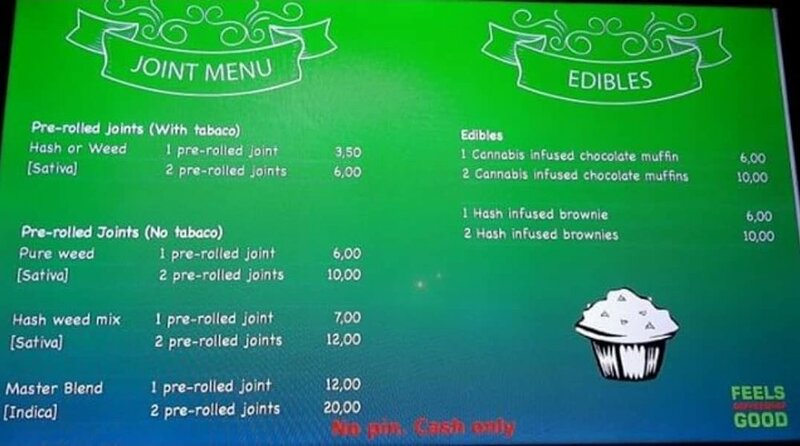 The menu is divided into two parts with weed on the left and the hash on the right. Wooden tables and chairs are provided throughout for seating which isn't the most comfortable but always seems to be quite busy regardless due to its location on the red light district. . This place is fairly priced especially for the area, with the weed ranging up to €15 for the top end strains and the hash ranging from €6 to €15 depending on what they have in stock at that time as the menu is regularly changing.